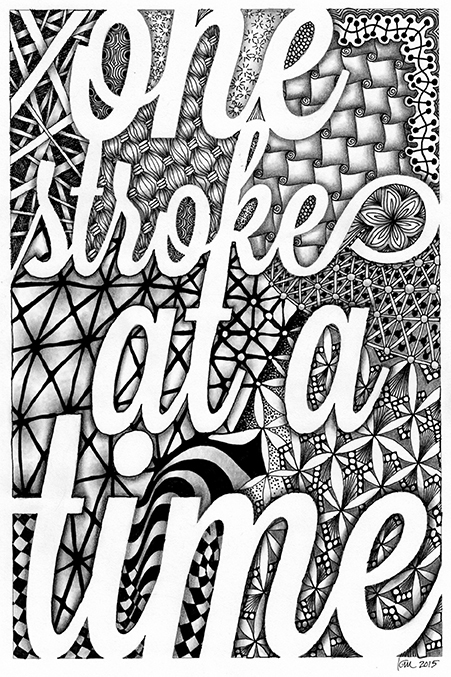 I just started a facebook group called “TangledType” for doing zentangle and doodles around all kinds of text. I subscribe to a fb feed that has nice sayings done in various typefaces, and it struck me that they’re all a bit lonely on a field of color, they need some highly patterned attention. I was really surprised, I got over 100 adds within the first few hours of starting the group. All I did was put a small text announcement on the Zentangle general group, and we were off to the races. So, there is a lot of interest out there in all things zentangle. I’m sure some folks will drop once they see what the deal is, but it was heartening just the same. I’ll post a weekly template of just the words done in various kinds of typography, sometimes from the ginormous repository of fonts I’ve accumulated on my computer, sometimes hand drawn in my so-so handwriting/calligraphy. It should be fun!